The sixth annual Collective:10 coming back December 2018!!! New plays. Same rebellious attitude. Thank you to all who joined us last year and participated in our NO EMPTY SEATS initiative! Please make a donation so that others can join the experience next time. 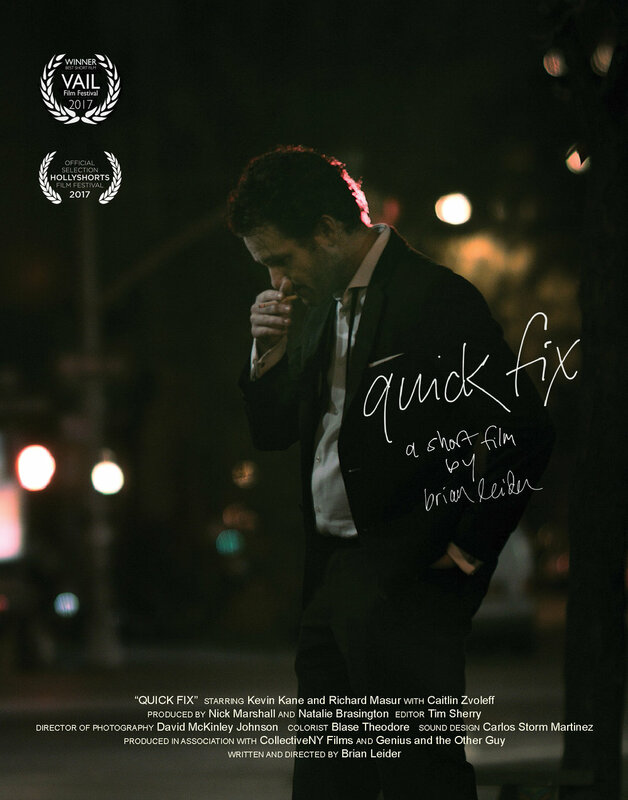 "quick fix" began its festival run with a world premiere screening March 31st as an Official Selection of the Vail Film Festival, where the film won BEST SHORT. The film since screened as an Official Selection of the HollyShorts Film Festival in LA. "quick fix" is written by Collective founding member Brian Leider and co-produced by fellow founding member Nick Marshall and member Natalie Brasington. 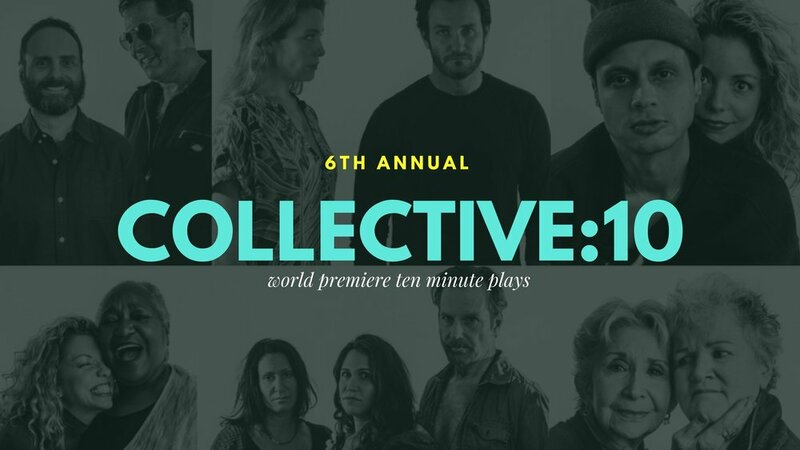 The Collective first presented this story, also written by Leider, as a stage play in the second annual Collective:10 short play festival in NYC in 2014. It is one of several plays The Collective has adapted for the screen. The film features Collective founding member and co-artistic director Kevin Kane and fellow ensemble member Richard Masur in the lead roles. "Uncle Silas," the adaptation of the 2013 C:10 play written by Sayra Player is one of the latest CollectiveNY Films hitting the festival circuit. The film, directed by and featuring Player, co-directed and produced by Rebecca Brillhart and produced by Rich Pecci, has been on a roll this year, screening at the New York Shorts Fest, Gasparilla International Film Festival, Miami Independent Film Festival, London’s Unrestricted Viewing Film Festival and the Auckland (NZ) International Film Festival. (Kevin Kane’s performance won the Best Overall Actor award at Aukland.) "Uncle Silas" brought home the Jury prize at the Albuquerque Internal Film & Music Experience with special guests T Bone Burnett, Jeff Bridges and Wes Studi in attendance. June 17th, "Uncle Silas" came home to New York City to screen as a part of Soho International Film Festival, and was selected for an additional screening. ("Turtleface" from CollectiveNY Films won the Best Short Film award at SIFF last year.) This year, Sayra Player won Best Lead Actress in a Short. The next screening will be at the Vail Film Festival! "Turtleface" continues its festival run as was an Official Selection of the Cape Fear Independent Film Festival in Wilmington, NC. "Turtleface" premiered at the Las Vegas Film Festival and the SOHO International Film Festival (WINNER - Audience Award, Short Film) in June 2016. It also screened at the Covellite International Film Festival in Butte, Montana, the Garden State Film Festival, Myrtle Beach Film Festival, as part of the Zamoxis Short Film Showcase in Santa Monica, CA, and won Best Editing/Photography in the Largo Film Awards in July 2016 and a Silver Award in the Los Angeles Film Review Independent Film Awards. Don't miss one minute of Season 4 of this Emmy-winning show! Fallen behind? How about a binge watch to catch up on any episodes you've missed, and keep your eyes peeled for familiar Collective faces popping up all over IAS. The Collective NY is a not-for-profit 501(c)3 production company. Our No Empty Seats Program allows us to give away up to half of every house to those people who, for whatever reason, cannot afford to pay. With ticket prices soaring on Broadway, a huge part of our audience is being left out. We want to take away the idea that theatre is for an elite audience and one way we do this is to eliminate cost as a barrier to great theatre. Your tax-deductible contribution, however large or small, will help ensure that we can continue our mission.